AIM: To challenge yourself as a Community Group TO DO SOMETHING DIFFERENT FOR 1 WEEK! ……that will help contribute towards a Sustainable World for us all. There are 21 ideas of what you might try here , but by all means use your own imagination! If in doubt, do it. If you manage it we`d like to know about it – at the end of your chosen week send in a photo of your group in action doing something different and we`ll add it to the `Monster Mural` appearing in various locations around Kendal. It must be something legal, suitable for public display, and most definitely fun. You could cheat if you like but what`s the point in that? (and if you wish the group members who took part). – decide between you and then give it a go! Collapse – is a Perfect Storm Brewing? It’s time to talk honestly about collapse. We are all aware of the mounting crises around the world. Resource depletion (water, oil, minerals, soil), population pressures, food shortages, pollution, climate change, species extinction, wilderness loss, and so on. It is a long list of challenges which are insurmountable within the current status quo, a status quo which is now being challenged around the world1, but which nevertheless retains a tight grip on financial markets and governments and doesn’t look like going away. In other words, unless the system shifts voluntarily to a new state, it will collapse. This collapse will affect us most, not the elite who reign over us. During the Irish potato famine millions died of starvation, while the rich establishment continued enjoying a lavish lifestyle, thanks to an iron rule – we need to learn the lessons of history to glean an understanding of what to expect. The time-frame for these events are within our lifetimes, and the odds are that before 2030 the world we know will be radically different. However, there is increasing evidence that conditions may change much sooner than we think, quite possibly within a year or two, and it is this I wish to focus on. A perfect storm of oil scarcity, financial breakdown and crop failures looks set to make 2011 a potentially disastrous year. The purpose of this mini document is to outline these three factors as they currently stand. I’m open to the idea that I’ve come to the wrong conclusions. But my conclusion right now is that I think the situation is real enough to warrant immediate action on an individual and human scale. The United States of America is already well into collapse. About fifty million people are currently dependent on food stamps for food from the government2. Unemployment is rocketing, and currently stands at 10%3 and this doesn’t include those who have stopped looking for work, or the vast number of part time low paid workers, which bumps the figure up to a staggering 53%4. Inequality is at record levels5. House prices have crashed 26%, unprecedented in the entire US history, and it’s getting worse6. Debt to GDP ratio is completely fucked – the debt is effectively unrepayable7. The apparent cohesion of the US economy is a mirage, a manufactured mirage that will vanish at the slightest tremor. Off the grid economic indicators show very significant increases in firearms, ammo and silver coins by americans8. Countries are responding. Mexico has flushed its economy of US dollars9. In retaliation, the US is threatening military intervention, on a different pretext as usual10. India has entered into talks with Iran to buy oil in exchange for gold11. The Chinese leader has openly stated that it is time to replace the dollar as the world currency12a. China and Russia have agreed to drop the dollar in bilateral trade12b. These are historic events on their own, with huge potential consequences. The US dollar is on the brink of complete collapse, and we are in the midst of a global currency war. Prices in gold and silver are skyrocketing as investors increasingly look to buy precious metals to secure their money. Last week JP Morgan announced that they will accept physical gold bullion as collateral13. China is mass buying hundreds of tonnes of gold14, along with India and Germany15a. Events are moving extremely swiftly, dangerously swiftly. We need to be very wide awake, and especially to the threat of a global currency, already being touted15b by the IMF as the ‘solution’, but which firmly entrenches global power in the hands of a very few unelected and unaccountable individuals. This has long been the ambition of the self styled ‘New World Order’ clique of powerful individuals. America, like the UK and many other countries, is effectively being run by a gang of banking gansters, and is being gutted and stripped of all assets. Authoritarianism is spreading, creeping invasively into our lives. China is the new model of ‘democracy’. The establishment know what is coming, and are preparing. Conspiracy theory, or plain obvious fact? What happens when the US Dollar collapses? The US will be lead into a new civil war. Sound crazy? The US establishment (like the UK) has already prepared. FEMA camps cover the nation, and are rapidly stocking up17. Emergency legislation is in place, with an executive to take control which is kept secret even from Congress18. The internet is set to be put under government control with internet kill switches such as used in Egypt. Tunisia and Jordan to quell revolt19. TSA are assuming massive powers20, along with many other government agencies21, the constitution is effectively void22. Industry and capital has already shifted abroad, ready to ransack other nations and continue profiteering. America is fucked. None of this narrative is on mainstream news, but all of it is happening as we speak, and the fact that it is not on the news is not surprising. Mainstream news has never been about informing people about the world situation, it has always been about control and misinformation on behalf of the establishment, and the establishment have NEVER been elected or accountable. What happens to the UK economy, an economy mostly dependent on food imports, an economy whose capital is the heart of the financial empire, an economy whose oil and gas industry is in fast decline? Alternatively, think about what is happening right now in the UK and USA with a fresh perspective24,25. Another thing to keep in the back of your mind regarding the world economy, is that around 90% of the money in circulation is debt. We live in a debt based economy. In a debt based economy the money supply must continue growing in order to pay off that debt. That means the economy must grow – the amount of goods and services produced must increase. To produce these goods and services requires energy. That energy is oil. Oil is the lifeblood of the economy. Every 1% increase in oil production equates to a 0.4-0.6% increase in GDP. So oil is important. It is literally what fiat currency is made out of. So how’s the world oil situation shaping up? Nowhere is the mainstream silence more deafening than the current global oil predicament. The idea that the establishment ‘don’t see it coming’ is ludicrous. Once you get beyond that, the implications become very serious. The easy crude oil is gone. Our economy runs on oil, cheap oil. There is no replacement for cheap, crude oil. To justify production of deepwater oil, tar sands and shale the industry needs high oil prices. But if oil gets more expensive, the economy goes into recession—as in the 1970s and in 2008. We’re stuck. If the economy recovers, demand for oil picks up, the price goes up, and we’re back in a recession again26. According to the IEA, the production from existing fields will decline by 50% by 202027. A mind boggling figure that requires some time to digest. Despite this massive shortfall, the IEA predict that world production will meet demand due to fields yet to be brought online as well as fields yet to be discovered, despite the requirement to find several times the oil capacity of Saudi Arabia to do so. Those familiar with the IEA will know full well that they have a long history of vastly over inflating figures, and that recent years have seen drastic reduction in oil predictions27. This means that the true picture is almost certainly far worse. In fact, there is every reason to be highly suspicious of the IEA figures, as they effectively show flat production values to 203028. World production has never been flat. The IEA are simply using terms like ‘yet to be discovered/yet to be developed oil’ in place of ‘this is how much oil we don’t have’ 29,30. To give just one example of dodgy figures, the IEA predictions are based upon Saudi reserves. These reserves are not verifiable, and are kept confidential by the Saudi’s. Since OPEC bases production on reserves, it is in each country’s interest to inflate their reserves, in order to maximise production and hence profit. A recent WikiLeaks showed that Dr. Sadad al-Husseini, the former head geologist in charge of exploration for the Saudi oil firm Aramco, had been informing the US that Saudi reserves are overestimated by 40% – 300 billion barrels of oil31. Saudi Arabia is responsible for 35% of world output. A 50% drop in production from existing fields by 2020 is unprecedented and nothing short of catastrophic. It is worth stating again, each percentage drop in oil production is roughly equivalent to 0.4 – 0.6% world GDP27. The level of discoveries required to meet this shortfall are simply untenable given the historic trend in oil discovery. What can we expect in the short term? The price of oil has remained staggeringly high despite the recession, and has recently topped the all important $100 dollars a barrel. Gasoline prices in the USA are at record levels for this time of the year32. It is difficult to find an analyst predicting oil price to be lower than 2010, with many predicting record prices33. 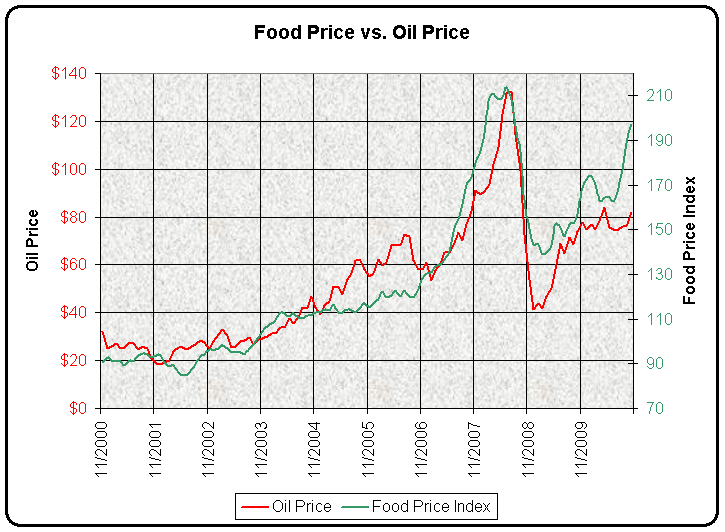 The price of oil closely follows the price of food, and food prices are critical to the bulk of the world population. So how’s world food production shaping up? The freak weather experienced globally is truly unprecedented in modern history35 and comes at a time when the financial system is at its weakest, and the oil supply straining. The weather situation globally is dire and is having, and will continue to have, a huge impact on food production. Quite literally, a perfect storm of freak weather worldwide has hit food production hard. On its own, this would be a difficult situation, and has already led to an outbreak of unrest worldwide. When combined with the financial and oil problems (bearing in mind the previous graph of oil production and food prices), this becomes seriously critical. The following is a summary of the worldwide situation, focusing on the main food producing regions. Mexico has experienced the worst freeze in 50 years36, which has affected 80-100% of its food crops. Mexico is a major supplier of food to the US and Canada, and prices there are expected to rise considerably. Last year Russia, one of the world’s major wheat exporters, experienced severe drought and wild fires which devastated its crops and lead to a ban on wheat exports37. This ban is now extended into 201138. Australia experienced record floods, hailed as one of the country’s worst ever natural disasters, which all but completely destroyed the winter wheat harvest.39 This was quickly followed by cyclone yasi, which devastated another of the country’s main food growing regions, affecting 80% of banana and sugar crops40. China, the world’s largest producer of wheat, is currently experiencing catastrophic drought across two thirds of its wheat growing area, the worst for 60 years41. The country is expected to increase imports ninefold compared to official projections42. In addition, Australia is China’s largest importer of wheat, yet Australia itself has seen freak weather severely damage crops. In the United States, the forecast for corn stockpiles was slashed by 9 percent on February 9, projecting the tightest supply since the Great Depression43. Many parts of the US are experiencing drought44, though it is thought that it is the use of corn for ethanol that is largely responsible. Other large regions experiencing freak weather include Pakistan, Southern Afrika and Sri Lanka45, 46, 47, which all experienced biblical flooding events. While I am unsure whether these events will have a significant effect on the global food market, it is certainly not going to mitigate it. 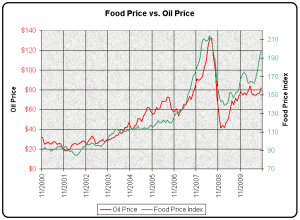 What is clear, is that the era of high food prices is here to stay, and that is going to create massive unrest and economic uncertainty around the globe48. The wildcard in the whole food shortage of course is the unfolding honey bee collapse, upon which a third of global food output depends49. The challenges we face are unprecedented in history. Never before has there been a global financial system controlled by a few, a financial system that now, thanks to the Iraq war, has its own standing armies of hundreds of thousands of well equipped troops and which has governments on its payroll, and which no government can stand against. Never before have billions of people been dependent for food on cheap oil. Never before has the rate of ecological destruction and pollution been so complete or so global. Never before have our actions threatened to destabilise the entire world climate – we are literally years away from starting a runaway train of global warming that will bring an end to the bulk of life on this planet. On the positive side, never before in history have people been so connected through the internet, not only to each other but also to information. We can talk today to people involved in the Egyptian uprising through Facebook. People round the world have a human face, knowledge and information is spreading through populations at lightning speed, all of which is grassroots and without top down control. The effect of this cannot be underestimated. Ten years ago Facebook and google were unheard of, now they are global phenomena with hundreds of millions of people using them daily – the pace of change is incredible. 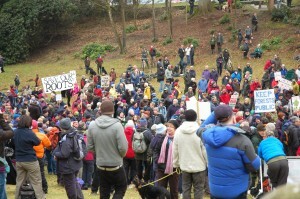 The beginning of 2011 saw protests and uprisings in countries around the world. It will not take long before a Chinese style controlled internet takes form, the doors are already closing fast, so our window of opportunity is narrow. This is the greatest crisis in history. How many of us are planning lives and futures based on a future that doesn’t exist? If we truly knew what was coming, would we still be worried about our pension, or our career, or our holidays abroad, or being embarrassed to talk about it in front of others? Several SLACC TT Food group members went up to Penrith today for a brilliant Cumbria Forest Foods Network workshop. Andy Goldring, head of the UK Permaculture Association (http://www.permaculture.org.uk/) gave his vision for local food security, encouraging as diverse a mix of methods of production as possible, including forest gardens, annual veg gardens, indoor sprouting, food preservation, wild food, mushroom production, local links (CSAs etc) and small livestock. ‘Spreading your bets’! His top tip was pink fir apples – a variety of potato which stores really well- sometimes up until April! Tomas Remiarz, research leader for the Permaculture Association, recommends Martin Crawford’s book on forest gardening – contact tsl.food[at]googlemail.com to borrow a copy from the SLACC food group library. Rick Cross, of Riversmeet Community Cooperative, Cockermouth is a driving force behind the CFFN. ‘This Network aims to contribute to the ecological well-being of all Cumbrian communities in a future Low Carbon Economy, by providing healthy food, outdoor recreation, fostering local enterprise and encouraging public participation through the Arts’. 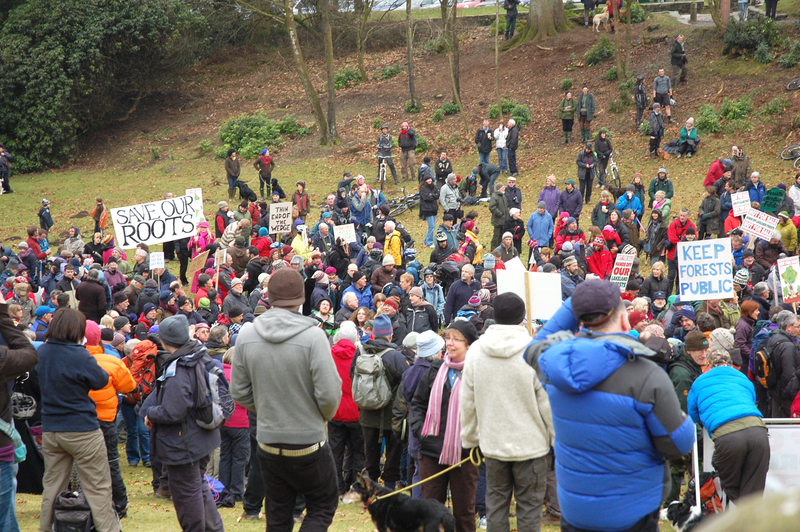 Rick emphasised the opportunity to build community through local application of permaculture and forest gardens, particularly considering peak oil. The group discussed the issue of access to land, a major stumbling block for communities wanting to produce more food locally. Do you have a forest garden? ( for an intro to forest gardens see http://www.agroforestry.co.uk/forgndg.html) If you are in Cumbria and haven’t responded to the questionnaire about Forest Gardens in Cumbria, please email naomi.vandervelden (at) cumbria.ac.uk to take part in the CFFN action research project. You are currently browsing the South Lakeland Action on Climate Change blog archives for February, 2011.